Don Brown wrote this great post in March 2008. I believe this is where I found the book on Weapons for the High Cactus. I hope you all enjoy it again. I’ve written a book in which a biplane played a major part of the story. In another, it was an old time car. But you’d never be able to recreate the airplane from one of my drawing, nor build a car using my image of the auto. That’s okay. Biography is my interest, not machinery. The images did their job: to advance the story about a person. But that doesn’t diminish my admiration for writers and artists who specialize in things. One of the best was Edwin Tunis. He was born in 1897. His father’s work took his family from town to town. Edwin studied art, became a World War One pilot, held design & art jobs, lost design & art jobs, and chased work as a freelancer. “As a commercial artist I lacked the ‘snappy’ style beloved of advertising agents, but I could draw furniture, architecture, and historical stuff, so I made out well enough.” he said. 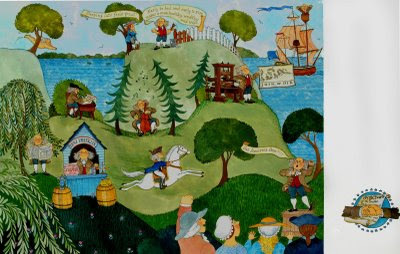 He designed a Maryland commemorative stamp, and painted historical murals. The Depression hit him hard and he took a momentary career detour as a radio announcer. World War Two arrived and he found himself working for the Black and Decker Company. It was published in 1952, launching fifty-five-year-old Edwin Tunis on a brand new career. Other books followed: Weapons, 1954; Wheels, 1955; Colonial Living 1957; Indians, 1959; Frontier Living, (a Newberry Medal Honors winner), 1961; Colonial Craftsmen, 1965; Shaw’s Fortune, 1966; The Young United States, ( runner-up for the National Book Award), 1969; Chipmunks on the Doorstep, 1971; The Tavern at the Ferry, (an A.L.A. Notable Book), 1973. Chairs, chests, tilt-top table, gate-leg tables, sailor’s knots, samp mortars, stirrup stockings, sugar cutters, mill gears, wagon wheels, pugmills, saw mills, querns, hetchels, hats, horses, horns, pewter mugs, and pocket-hoop farthingales. Do you want to learn how to scutch flax? Play huzzlecap? Pack a hogshead? Tunis shows you. All are remarkably drawn with painstaking accuracy, yet with a buoyancy and immediacy that gives the images a singular liveliness. Tunis died in 1973. In time, his fabulous books fell from print. But sometimes a bit of serendipitous good luck prevails, this time in the shape of Johns Hopkins University Press. There is much to admire about Tunis: His extraordinary artistic skill, and his dedication to accuracy, to be sure. But his dogged pursuit of a life in the arts, one that didn’t find success until late in life is also inspirational, at least to this battered ex-freelancer who didn’t come to children’s books until he was over forty. But life, being what it is, delivers a piquant end to the Tunis story.In 1989, The McCormick Building was demolished. With it went Tunis’s Spice mural. And just like in the Joni Mitchell song, in its place they put up a parking lot. Some of you will remember that my daughter, the Marquis, wrote a guest blog a couple of months ago. Well, any mom knows that equal time is a must. So may I present a guest blog from the High Cactus, my 12 year old son. He's an avid reader, fabulous storyteller, and techno-geek genius; most of our INK bloggers know him simply as our technical support staff. Today he offers an interesting discourse on where his reading has led him. I can tell you from personal experience this is not a fictionalized account. I’ve always liked big things. I’ve always liked old things. I’ve always had a taste for destruction. So, it is no surprise that I have been lured by the best thing that fits that description: siege weaponry. It all started when I was very young, and I read books about knights and tales of castles and dungeons. But what always caught my eye were the huge boulders launched from wooden contraptions that knocked down walls and destroyed cities. As I grew older, and started reading more in-depth books, I soon discovered the answer, so it seemed, to my questions: the mythical wooden device was a catapult. Thinking that the mystery was solved, I was content. That is, until my mother brought home a book about medieval weapons, compete with detailed blueprints. This is when I learned that I had been deceived: the catapult was only the most basic thing one could learn! It turns out that there was a whole story behind the many kinds of huge, wooden, projectile-hurling cannons. I read about the Roman and Greek ballista, a sort of giant crossbow on wheels that fired huge bolts at opposing armies. I learned how a mangonel, although almost identical, differs from the onager. I found out how the gravity-powered trebuchet could fling stones much farther, harder, and more accurately then other catapults. This, of course, prompted more book borrowing and net surfing. I learned the inner-workings of a spring-based catapult, and compared it to my findings of counted-weighted trebuchets, and discovered how one was superior to the other. Now that I had an extensive knowledge of many outlandish contraptions and their workings, I had only one more question: why. I was yearning to know what in the world these terror machines were used for. I then discovered siege warfare. The idea was amazingly intriguing for me. I read all about it, and learned about different battles and styles of different nations of the ancient world. I was also, at the time, reading The Lord of the Rings. I had arrived at the part of the book where Gondor goes under siege—and found to my delight that my favorite pre-gunpowder WMD were used. I was a great experience to have my newfound knowledge of the real world be brought into my favorite fantasy world as well. I could picture myself, surrounded by thick walls, with huge boulders and rotting corpses raining down upon me. I amazed me how deadly war could be, centuries before tanks and bombs. Siege weapons, although always an interest, were put on the back burner for a while. But it was my mom that ignited the fire once again. She purchased a book for me giving instructions on building potato cannons, fire kites, and yes—a small, working model onager. The instructions were a little shaky, but sure enough, in about 3 hours I had my own half foot working catapult. As I fired walnuts and cashews across the room, I had only one thought: BIGGER! I got to work drawing up plans for my new project: a catapult. Eight feet long, high powered, and sure to be just about the most awesome thing ever, this was going to be a big project. I changed much of the design from the original model, and added a safe firing system. I used Google SketchUp to draw a 3D model of my creation. Construction and completion of the ultimate water balloon war weapon will begin very soon. I highly encourage all of you to learn about amazing robots from long ago: educate your selves in siege weaponry today. I’m just back from almost two months in Southeast Asia, with visits to four international schools (private schools with instruction conducted in English) in Indonesia, Singapore and Malaysia, along with a teacher conference in the exotically named city of Kota Kinabalu on the island of Borneo. I had many eye-, ear- and mind-opening experiences during my time in Asia, and I’ve been thinking about books that might come out of them. When I was in college, I met an entomologist who was the world authority on fireflies and their flashing behavior. Dr. Jim Lloyd had figured out how females of various species use their specific flash patterns to attract mates of the same species (which he was able to attract by mimicking the female flash pattern with a penlight. He also discovered something so sensational that it was written up in the popular media: the females of some species mimic those of a different species to attract males of that species — not for procreation, as the arriving males expect, but for predation. When the unsuspecting males land next to their would-be mates, they are in for a rude surprise: they get eaten! These bamboozling females were dubbed “femme fatales." Dr. Lloyd also told me about the synchronously-flashing fireflies of Southeast Asia which gather in vast numbers on trees and flash in unison. His description of this natural spectacle left me agog. Neither he nor any scientist had done the research to learn why they did it, how they used the flashes (possibly for mate-attraction but no one really knew), whether the flashers were all male or all female or mixed, or anything else about the behavior and natural history of these little-studied insects. He had seen them only once, briefly, and it was his hope to return to investigate. Last month, during the weekend preceding my residency at the International School of Kuala Lumpur (Malaysia), several teachers and I went to Fraser’s Hill, a bird-rich site about three hours’ drive from the city. During our two days of birding and “arachniding” (we saw tarantulas and some very cool trap-door spiders), it came out that Malaysia’s most famous firefly site is located near Kuala Selangor, a mangrove swamp just a short detour from the route we would be taking back into town. Transportation was reorganized so that I could go there to see the show. The assistant principal of ISKL’s Lower School, Heidi Webster, would be my driver and companion for this excursion. I was jazzed! At sundown, small flat-bottomed skiffs leave the dock at Kuala Selangor every few minutes. Each boat holds four to six passengers and a pilot who stands in the stern to pole the vessel across the shallow river. The trees on the far shore are laden with “kelip-kelip” — that’s the Bahasa language name for these synchronously-flashing beetles. Their twinkling came into view as soon as we floated out of the glare of the well-lit boat dock. I was in the boat with Heidi and an English-speaking Malaysian couple who were willing translators. I had much to ask the boat pilot: basically, the same questions that entomologist Jim Lloyd had raised all those years ago. Unfortunately, the boatman knew only the “where” of these insects, not the “how,” “why” or “what.” Just the same, it was a vastly rewarding experience, a long-held dream that had just come true, seeing these fascinating creatures do their thing — and in unison. . . sort of. Even without having unlocked the secrets of the fireflies, I was able to make a few observations. There are not thousands, tens of thousands or hundreds of thousands of fireflies on each tree, as I had variously heard. I would say there were a hundred, maybe two hundred, per tree. Possibly their numbers vary by time of year, time of night, weather conditions or who-knows-what. I also noticed, contrary to what many had said, that the fireflies were not all in synch. On any given tree, I usually saw two cohorts, each with its own flashing cadence, and a sizeable number of outliers out of synch with everyone else! Would this change over the course of the night? I dunno. It wasn’t a research trip — the boat ride was only about half an hour. Were the insects of different trees in synch with each other? That’s what I really wanted to know because all the descriptions I had read stated or implied that the entire spectacle was a well-coordinated light show. In truth, I could not tell for sure from the angles we had on the trees, but I don't think so. And what do the fireflies do after a night of flashing brightly on the river? Do they have a different kind of adventure? Is there a way to track them to find out? Clearly, there is much to learn. My assignment, should I choose to accept it, is to find out what is known. Or find someone equipped to learn new things in this minute nook of a miniscule corner of human knowledge. Then perhaps I could go along with him or her and follow the process of discovery. Or maybe I could write a fictionalized version of the non-fiction story, perhaps with a firefly as the main character. To become a book, this inchoate assemblage of observations and information must take a shape, find a voice and give itself a raison d’être. The author must paint a picture of a time and place, and populate it with characters, both human and arthropod, and find a beginning, a middle and an ending. It’s going to be a lot of work. But what book isn’t? PS That was to be the end of my post, but after writing it, I learned that in 2001 Sneed Collard published a book very much like what I have just ruminated upon: A Firefly Biologist at Work. Sneed tracked the research of a biologist studying the synchronously-flashing fireflies of Papua New Guinea. So now I am faced with a dilemma known to all non-fiction authors: Someone has already written “my” book! Does that mean I should give up the idea? Perhaps. Unless I can find a route to a very different kind of book on fireflies, I would not want to go down an already well-lit path. To be honest, when I sat down earlier this week to write this post, I was totally out of unique, creative, and fun ideas. Now, if my post day was April 22, easy topic: Earth Day. If my post day was April 21, of course: National Creativity Day. Even April 15th, Leonardo Da Vinci's birthday, had some great content for a blog post. So, let's see, what "day" is April 24th? Of course, I quickly consulted google. Arbor Day could be a good topic. National Pigs in a Blanket Day might not have much content. Now, this looks interesting - The 20th Annual Youth Services Day. Eureka! We have a topic! Global Youth Service Day (GYSD) is a time in the year when we come together to focus the world’s attention on what young people are contributing every single day. GYSD is organized by Youth Service America with the National Youth Leadership Council, the Global Youth Action Network, and with thousands of partners in the U.S. and across the world. Learn more about the partnerships that make Global Youth Service Day possible. During Global Youth Service Day, millions of youth around the world organize community service projects to address the needs of their local communities through service, to be recognized for their contributions, and to be a part of a global youth service movement. GYSD is held during a weekend every April in over 100 countries in every region of the world. In 2009, the event will be April 24-26. From the Global Youth Service Day Website. From many sources, community service and volunteering is quickly becoming a major trend in this economy. President Obama on Tuesday signed the Edward M. Kennedy Serve America Act authorizing a major expansion for funding to federal community service programs. Calling for 25 percent increase in funding, it passed with strong support from both sides of Congress. What can our children do? What community service projects are there? How can we light a spark to engage a student's volunteering spirit? There are so many areas that need help, but how do our youth find a cause that engages them? This week, as part of National Volunteer Week, my son's elementary school held an assembly to honor all the PTO volunteers. There was music and beautiful speeches by the students. Each volunteer got a red rose. What a wonderful way to set an example for the children to show that volunteering is honorable and giving thanks to those who do is respectable. Here are a few of the more current books on community service for kids, which will hopefully begin a life long, character building passion for helping others. Be the Change! Change the World. Change Yourself. Very inspiring book that honors many individuals shows how each one of us can make a difference. 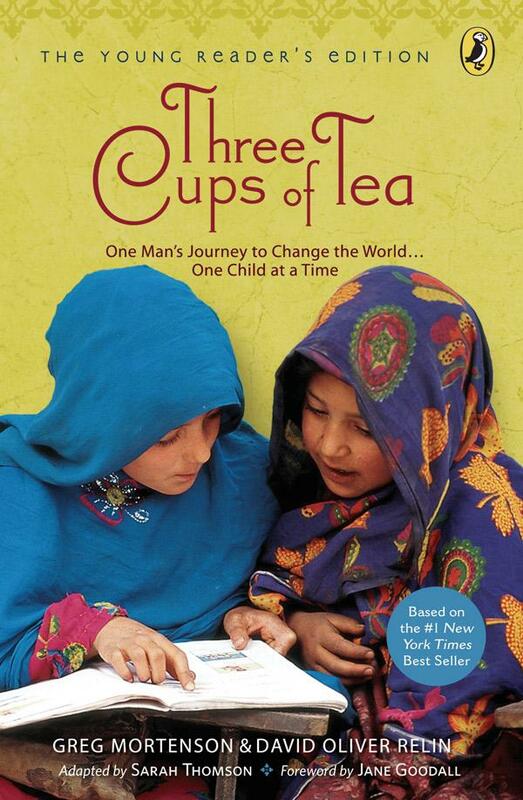 This adaptation for young readers of the bestselling Three Cups of Tea tells the story of Greg Mortenson. The book engages kids into Greg's story by relating the story to kids. An interview of his daughter, Amira, gives a wonderful perspective of the experience through a 12 year-old's eyes. This picture book version of Greg Mortenson's Three Cups of Tea is told through the Pakistani children and their experience of the story. Beautiful, captivating illustrations. Very up-to-date and fun book for kids. When I arrived, the royal court was assembled in full fancy dress. I was instructed to hide behind the castle wall. The crowds rustled and waited. Someone handed me a tiara and a wand. "You'll need to wear this," she said. Ha, ha! I'd always secretly pined for a tiara. I donned my finery and walked out beneath the crossed swords of the counselor and the voice therapist. Music blared. Crowds roared. I was seated on a throne. Trumpets sounded. 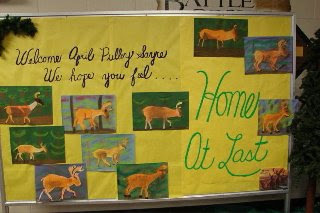 "We declare the next three days to be April Pulley Sayre days in the kingdom of Libraria!" The crowd went wild. Performances began. 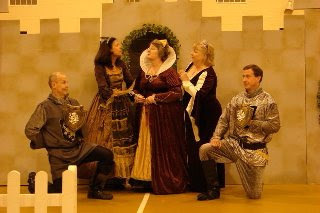 First the staff (all in royal dress) conducted a play celebrating alliteration and other writing techniques that create compelling nonfiction, specifically mine. Could a nonfiction author ever hope for such a reception? Yes. This really happened to me last week at Battle Ground Elementary in Indiana. And, no, that's not me in the queen outfit. That's a teacher! This staff is extraordinary. They love words. They not only read my books; they analyzed the books and studied the writing techniques. Their classrooms are full of active writing. Even the smallest child there knows onomatopoeia and alliteration. The staff had training in many areas of writing. And they were actually using it. After the faculty put on the play, classrooms and grades stood for their contributions. Songs of bumblebees and feeding larvae. 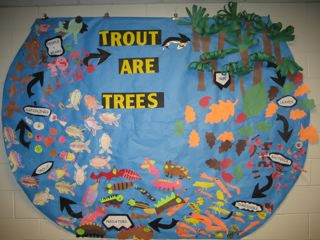 Songs to celebrate Trout Are Made of Trees. Chants about libraries. Songs about reading, accompanied by percussion and conducted by the music teacher. A multi-part rendition of Ant, Ant, Ant: An Insect Chant, complete with homemade paper insects on sticks. Trout, Trout, Trout: a Fish Chant was performed by pairs of students who sported fish headbands. They had created hand motions appropriate to each fish name. Thirty or so students with recorders stood up and played to accompany one piece. Students with beautiful bird masks spoke the words to Bird, Bird, Bird: a Chirping Chant. Surely this was fiction or at least a dream. Hadn't I just been to a school where none of my books were in the library, no one knew my work, and the classroom teachers were in a meeting during my talk? Well, yes. Two weeks before I had been to one of the worst schools of my career. This amazing school, in the very same state, had to be a hallucination. Yet it was real. Making reading and writing joyful is not a one day effort to show off for a visiting author. The royal play I had witnessed was part of a year long theme. Original mini-plays celebrating writing and reading are written by teacher Jolene Freeman and conducted three or four times a year as part of a huge reading celebration that culminates with a community event involving parent volunteers. This is a public school. It is not a rich school in a fancy area. They save up to bring in an author every other year. They are in the countryside. They have a relatively high proportion of Title I students who face varying challenges. This is a staff that works very hard to create this learning environment. They are daily, creatively bringing out the best in their students. They do this even though this year they are split between two buildings down the street from one another. One librarian with two libraries. One principal with two school buildings. I saw the principal pitch in and help with anything and everything that needed doing—all the way to clearing plates and setting up books for a signing. Thanks to an extraordinary art teacher, the walls were blooming with gorgeous art related to my books. Art animals migrated everywhere in honor of my book, Home At Last. 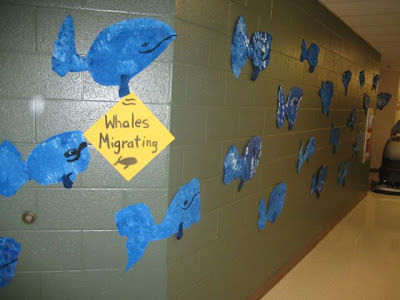 Sponge-print whales swam the hallways. Chalk and glue-relief turtles flippered past. Block print lobsters walked along the floors. Butterflies with see-through tissue wings fluttered in the air. 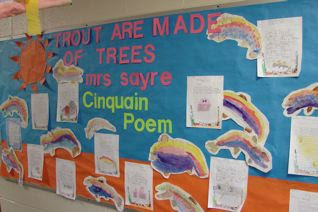 Educators created poetry, nonfiction books, science diagrams and other projects to go with Trout Are Made of Trees, The Bumblebee Queen, and other books. Connie Hayman, the well loved, practically legendary librarian who had invited me, had retired. Yet the new librarian, Mrs. Sturgeon, embraced this author day with gusto. When some faculty were less than excited about a nonfiction author coming, she wrote promos to get them interested in the books. Soon, all faculty members were on board. They love lyricism and narrative techniques. A few were surprised to find it in nonfiction. Of course, as INK readers, we know better. Great nonfiction techniques are on display in the books discussed here every day. 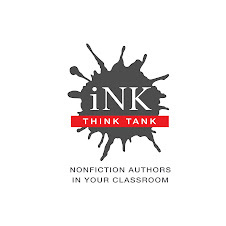 I have been fortunate to visit many schools that go the extra mile to celebrate nonfiction and incorporate writing into students' lives. I share their photos and ideas on my website. But this school? Well, I'm kind of still glowing about it. This experience should get me through hard work ahead. 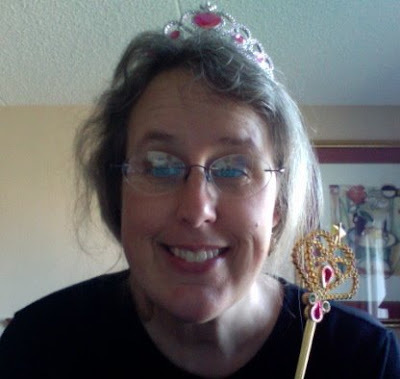 Yes, I still have the plastic tiara. I think I'll put it on and go write a book. Once an English major, always an English major. Now that Garrison Keillor has made our geeky selves rather cool (at least to each other,) I can publicly admit how much I love to dive into books and pick them apart. And when I read Rosalyn Schanzer’s delightful recent post, Coming to the Theater Near You! 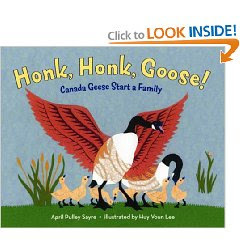 and April Pulley Sayre’s stunning Honk, Honk, Goose! Canada Geese Start a Family (illustrated by Huy Voun Lee,) I couldn’t resist taking a dive. So, back to Rosalyn’s movie talk…. As a Screenwriter Sayre has written a tale of romance, danger, and heroic vigilance. Our hero, Father Goose is handsome, assertive, brave, romantic, and good with children – every female’s dream. But his is not an easy job. Predators lay in wait to harm his family. He sometimes fails to avert trouble, but he never gives up. Sigh. What a guy. Co-directors Sayre and Lee work together to give this story passion and drama. Lee’s stunning cut-paper illustrations give us a stylized but realistic rendering of the world of Canada geese – habitat and predators, as well as details of domesticity. Danger abounds, which Lee shows us in many spot illustrations, but Father Goose is ever-alert. Sayre, as always, uses nature sounds and rhythms to dramatize her story. Costume Designer Lee exquisitely uses her cut-paper medium to give us finely-cut feathers on the wings which, when spread, dominate the page. She uses downy-textured papers for the geese and goslings’ bodies. Thus we “feel” the power of their bodies and the fineness of their down feathers. Father Goose’s stunts are set up by both author and illustrator. As Stunt Co-coordinators, Sayre describes a raccoon invading the nest and breaking an egg. Father honks, hisses, and lunges. Lee shows us a scary goose in profile, wings reaching beyond the page, neck crossing from one page to another. I’d run away too, like the raccoon. These are Sayre’s Special Effects that bring her hero and the story to life – a sound design that begins with lots of honks, followed by splishes and splashes, flap flaps, more honks, crack crick peeps, still more honks, plop plops, peeps and yawns, and ending with Father’s triumphant Honk. Well done, Father Goose. Well done, April Pulley Sayre and Huy Voun Lee. Me: Pam, could you please pass the salt? Pam: Also Ellen was the first woman admitted to M.I.T. and did you know that she founded the first health food take-out restaurant and was the founder of Home Economics? Pam: Deb, it all comes down to Ellen. Pam is besotted. She talks about Ellen all the time. Did I mention she also giggles when she talks about Ellen sometimes? She is completely obsessed. And this is how it should be. I have written four biographies and each time I fell in love. It wasn’t always love at first sight, and sometimes I had to fight to stay in love. But love it was. And being in love with your subject serves an author very well. Because when the road gets bumpy, love keeps you going. My first love affair was with Barbara McClintock. 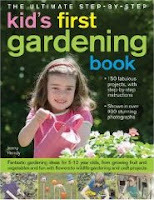 I had heard of Barbara back when I was an editor at Scholastic News (See Karen Romano Young’s post of March 5, 2009). McClintock won the Nobel Prize for her discovery of jumping genes and we ran a photo of her holding up an ear of maize, the plant she worked with. A few years later, I was thinking about how much I loved biographies as a kid and I decided I wanted to write one about Barbara McClintock. She had won the Nobel Prize for work she had done three decades earlier and when she finally won, interviewers asked her, "Wasn’t it hard that nobody believed you for all these years?" She answered she knew she was right, and “it would all come out in the wash.” What kind of person believes in herself so much that she keeps on working despite the fact that nobody believes her? I had to write about her so I could find out what made her tick. I read the first chapter of an adult biography of her, called A Feeling For the Organism by Evelyn Fox Keller, which gave some insight into McClintock as a person, and I was hooked. I wrote a proposal, got a contract, and then read the next chapters of Keller’s book and realized I couldn’t understand the science AT ALL. The short arm of chromosome number 9? What is a chromosome? Jumping genes? What is a gene? How do they work? I had barely taken any science since 9th grade biology. I wanted to give my advance money back. But of course I had already spent it on diapers and cheerios and printer ink. I had to write the book. Besides, I was already in love, which was a very good thing because I stayed up late many nights giving myself a crash a crash course in genetics so I could write the book. So what do you do when you find out things about your person you don’t like? You take a deep breath and say, I am a biographer. I am not, actually, marrying the person. (Not that the people we marry are perfect, either.) You tell yourself that you are obliged to give a full portrait of your subject. And you want to. Within limits, when you are writing for kids. Writing is all about choices. Did I write about J.F.K. 's extramarital affairs? No. Not only was it not relevant for kids, it was not an integral part of the story I was telling. Did I write about the fact that he and his family covered up his poor health so he could win the election? Yes, absolutely. It was an integral part of the story: his illness and the decision to cover it up shows who John F. Kennedy was. When kids read the book I hope they come away with a sense of the real person – a boy who grew up in a large family in the shadow of his older brother, and overcame illness to become President of the United States. I must admit I was glad I couldn’t write about the affairs. Love can be hard. Love is hard when your subject dies. I spent many years thinking about, researching, and writing about Charles and Emma Darwin for Charles and Emma: The Darwins’ Leap of Faith. And every time I read or wrote about Charles or Emma dying, I cried. As time went on my tears did not lessen. Because as time went on I was more deeply in love. I wasn’t always in love with Charles Darwin, and I barely knew he had a wife. My husband sort of owned Darwin in our family. But one day he (husband, not Charles) said to me, “Did you know that Charles Darwin’s wife was religious? And they loved each other very much. She was upset that he would go to hell and they would be separated for eternity.” I fell in love with the subject immediately: marriage, science and religion, God, devotion, death… I knew I had a book to write. Now I just had to fall in love with Charles and Emma themselves. Primary sources were the way in. I read (and as the research went on, read and read again) a two-volume book called Emma Darwin: A Century of Family Letters. There is no surer way to love than through someone’s personal correspondence—assuming, of course, that person is wonderful and articulate and funny and kind and spunky and true and (oh, dear, stop me). I was in love with Emma. But I can't help it. I'm in love. And too, history is positively juicy with adventure and it's loaded with role models. Me being sort of a sissypants, I admire my sturdy, stubborn subjects: pilgrims, reformers, and a particularly persistent fellow who used to live a couple of blocks from my house. President Truman would have had his 125th birthday next month if he hadn't gotten his ticket punched back in 1972. He's the subject of The Harry Book, my first comic book biography. According to Mr. Truman, "the only thing new in the world is the history you don't know." A historical vantage point helps us to understand how we got here so we're not wandering around on the world's stage with no idea of what the play's about. After all, any nation is more than its borders and banner; it's a combination of all the stories of all who’ve lived in the land, all down the years of the living past. Knowing what people did and survived helps to explain why peoples and governments behave as they do. A nation is like a person whose experiences and ancestral blood make for a lot of explanation, identity-wise. I’m me because of Ray & Elaine Harness & the rest of my ancestors, their blood, their inclinations, plus all that I've done, been, and read - especially the works of Laura Ingalls Wilder. Ten times a piece. I'm an accumulation of it all. Who we are is who we have been. Anyway, I figure that knowing what folks have survived gives us courage to face what trials we have and a sense of history gives the present a boatload of drama and serious fun. After all, just about all of us live where others, generations of others, once lived, none of them knowing what the future held. A sense of history livens up the calendar with anniversaries and just about any set of numbers with – uhm – associations. When I see 1836 on the odometer, I think ‘Alamo!’ If the person behind the counter rings up $10.66 on the cash register, don’t you think ‘Battle of Hastings’? I’m afraid I do. Ah well, on tangents I’ve been known to digress and all I meant to do was tell you how I came to write about the past besides the fact that I'm way better at drawing horses than cars. More about that in the future, Fates willing. Jan Greenberg wasn't able to post today. Here are some interesting writing tips she first shared with us last May. The following are some words of advice I give writing students, as I travel around the country teaching workshops. I’d love to hear from some of you if you have other writing tips that I can share with my students. 1. The first tip has to do with revisions. In high school (a few hundred years ago), when I told my English teacher, my first real editor, that my fantasy was to someday be a writer, she said, “You have to write a million lousy words before you can begin to get it right.” I was lucky that my first novel (A Season In-Between 1979) found a publisher right away, but it went through five revisions before it went to press. Writing is rewriting. Collette said you have to murder your darlings. Flaubert said you can’t be married to your words. 3. I never begin a story, either fiction or non-fiction, without having a sense of beginning and end. Writing a story is like making a sandwich. What do you need to make a sandwich? Yes, two slices of bread. What goes in between the slices can be added as you go along, a tomato here, a marshmallow there. But you need bread to hold the parts together so they don’t fall apart. It’s the same principle for writing a story. Reserve the right to change the ending, but at least you can see a light at the end of the tunnel, so you’re not stumbling around in the dark. Nonfiction and poetry are two of my favorite things. Like peanut butter and chocolate, they go together well. In honor of National Poetry Month, I decided to feature a few nonfiction poetry titles to highlight how an author’s voice can breathe new life into nonfiction. The Surrender Tree: Poems of Cuba’s Struggle for Freedom by Margarita Engle (Holt, 2008). School Library Journal called this Young Adult book “hauntingly beautiful, revealing pieces of Cuba’s troubled past through the poetry of hidden moments.” This incredible book won a Newbery honor. Doug Florian, what can I say? 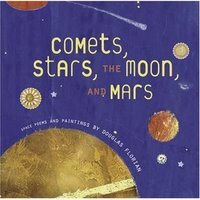 Color me a fan of Comets, Stars, The Moon, and Mars: Space Poems and Paintings (Harcourt, 2007). I love the variety here, including the concrete poem about a galaxy in the shape of a spiral. This reader can feel his passion for the topic on every page. And if you’re looking for fun nonfiction, you need go no further than his Insectlopedia (Harcourt, 1998). Insectlopedia brings to mind another wonderful book—Paul Fleischman’s Joyful Noise: Poems for Two Voices (HarperCollins, 1988). This title, with illustrations by Eric Beddows, won the Newbery in 1989. The collection is written in the form of verbal duets, which are stunning, creative, informative, whimsical, and a ton of fun to work on with students. I did these with a group of 8th graders a few years ago and the more they recited them, the more excited they became, spinning like water bugs and clicking like cicadas. 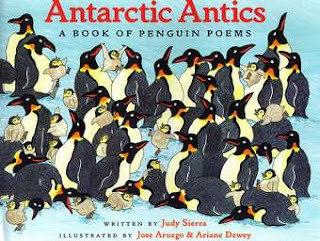 For younger readers, also try Judy Sierra’s Antarctic Antics: A Book of Penguin Poems (Sandpiper, 2003), with illustrations by Jose Aruego and Ariane Dewey. Little ones will laugh and learn as they read about the world of emperor penguins. So celebrate National Poetry Month with a pairing of nonfiction and poetry, and enjoy! • It’s fun to grow your own food whether it’s just one pot of herbs or a multi-rowed mini-farm. • Homegrown crops taste great! • Kids are more likely to eat previously rejected goodies they grow themselves. • Fresh picked fruits and veggies have more nutrients than produce that’s been sitting around. • A much greater variety of cultivars can be grown that won’t be found in grocery stores. • Chemicals can be minimized or avoided. 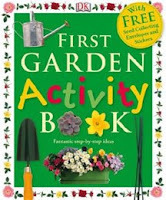 • Gardening saves money. A few dollars worth of seeds can yield a harvest worth much more. • Gardens save energy. Many food products must be shipped hundreds or thousands of miles to the grocery store. 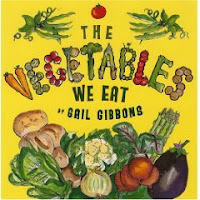 • Growing your own food is empowering, teaches valuable skills, and encourages self-sufficiency. For some hands-on inspiration, check out these photos of First Lady Michelle Obama and friends planting the White House Garden. A PDF of the layout can be downloaded from the same page. 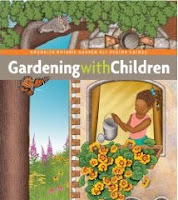 A mother and daughter dig, plant, and water a flower and vegetable garden. Planting a salad garden, making unique sandwiches, pressing flowers, and windowsill gardening are some of the projects illustrated with photosgraphs. Stickers and seed envelopes are included. Young gardeners will discover many veggie options from edible leaves to succulent stems to tasty roots. Data on improved student performance, environmental literacy, and eating habits. Funding sources, garden designs, maintenance requirements. Lesson plans, material lists, book resources, web bibliography. This book won’t be released until May... it has 150 projects for ages 5–12 that are illustrated with over 900 photographs. 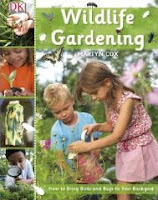 Shows how to plant a habitat with food and shelter for wild creatures such as bees, butterflies, and bats. Making a root-view garden, chlorophyll prints, a hummingbird feeder and more from the the home of the oldest children’s garden in North America. A couple of months ago I wrote about a year-long road trip Robin Page (my wife), our 10-year-old son and I are planning. In response, I.N.K. readers gave me some good leads on homeschooling resources and provided some philosophical guidance. Lately, as I continue my homeschooling research, I've been coming across a lot of references to 'unschooling'. This is an informal movement (with a patron saint: John Holt) that has been around for years, but I encountered it only recently. Unschooling appears to range from what we might think of as typical homeschooling (if there is such a thing) to a free-form experience-life-as-it-happens approach, in which children explore whatever they happen to find interesting. In the latter case, it's up to the parents to make sure that a child is exposed to lots of different potentially engaging situations. To some extent, unschooling is simply a rebranding of homeschooling, which has found itself increasingly identified with a fundamentalist Christian movement that has mostly to do with limiting children's contact with ideas and personalities that didn't fit comfortably into that particular worldview. Over the past few months I've been reading homeschooling guidebooks, reviews of homeschooling curricula, and looking at a lot of downloadable math and language arts worksheets. I was beginning to think that — even with a fairly unstructured approach — teaching the sixth grade in a VW camper had the potential to make everyone miserable. Robin and I began to shift our concept of homeschooling more and more toward an experiential, Jamie-directed model. Discovering the unschooling movement (which is more about how one doesn't teach a child than it is a specific educational recipe) has reinforced that inclination. What, the reader may ask (with some justification), does all this have to do with Interesting Nonfiction for Kids? There is a connection, I feel certain. One of the intersections involves a book I've been spending some time with lately. I've referred to it previously in this space: Writing to Learn, by William Zinsser. The premise of this book is that one of the the best ways to learn about any subject is to write about it. Science, history, even math: the act of crafting clear, concise prose teaches both medium and message. Now we just have to figure out how to convince our 6th grader that in composing elegant mathematical word problems he is choosing to pursue his own interests. I have to admit there is a bit of a contradiction here, our focus on self-directed learning while editing Jamie's description of campground flora and fauna. I like to think of it as creative tension. Thankfully, this post is relevant with the simple change of a preposition: Interesting Nonfiction by Kids. One reason why Jim Arnosky’s books are so engaging is that he’s in them. He uses “I walked watchfully” and “I was crawling on my elbows” in a way most nonfiction authors shy away from. 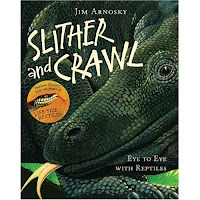 In his newest, Slither and Crawl: Eye to Eye with Reptiles, you are right there with Jim as he shares his fascination with snakes, lizards, turtles, alligators, and crocodiles. He answers the question most on my mind-- how can you get over your fear of these guys-- and lots of other questions budding naturalists will have. 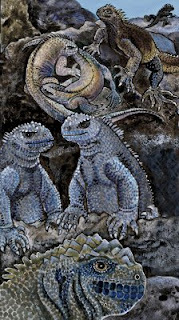 He paints many of these creatures as life-sized, and in four lavish fold-out spreads reveals more species and even more details (Sterling, ages 8-12). I find that most kids are boggled to learn that discrimination against women was common and perfectly legal, and it wasn't that long ago. 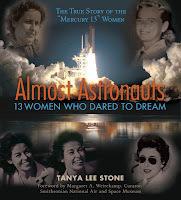 In Almost Astronauts: 13 Women Who Dared to Dream, I.N.K.’s own Tanya Lee Stone does us all a favor by giving this bias an exhilarating context. In a little-known-to-the-point-of-being-invisible episode in history, thirteen women passed all the tests to become astronauts, only to be turned back when NASA couldn't wrap its mind around the idea of women in space. More than twenty years before Sally Ride took off in 1983, the "Mercury 13" were fighters, dreamers, and serious role models way ahead of their time. Lots of great material here-- especially about women's history (the TV shows, books, and organizations that changed attitudes)--though kids might be most drawn to the drama of the stringent physical tests. Now appearing to starred reviews everywhere (Candlewick, ages 9 and up). 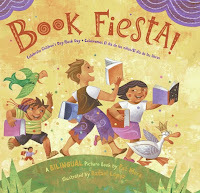 This April 30th, honor the Day of the Child with Book Fiesta!, subtitled "Celebrate Children's Day/Book Day; Celebremos El dia de los ninos/El dia de los libros." 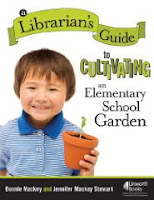 Pat Mora's text is straightforward to the point of being nonfiction--an itemization of the coolest places to read books-- and in the back she includes helpful hints for families and teachers to emphasize literacy. 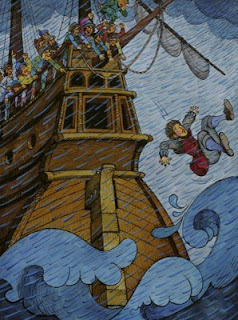 The illustrations by Rafael Lopez are boldly stylized in an almost Alice-and-Martin-Provensen way, and the entire production is, of course, totally bilingual (Rayo/HarperCollins,ages 4-8). Turn off the TV, and read a book... about TV. 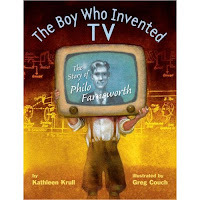 My publisher might not appreciate this association, but you could celebrate TV Turnoff Week, starting this April 20th, by pre-ordering The Boy Who Invented TV: The Story of Philo Farnsworth. Yes, we could blame our whole TV culture on a 14-year-old farm boy who dreamed up the first television back in 1920-- but wait, Philo thought he was inventing a force for good, and in later life wouldn't let his own sons watch what he decided was drivel. My biography, with startlingly electric paintings by Greg Couch (who also illustrated Sue Stauffacher's Nothing but Trouble: The Story of Althea Gibson), won’t be out till this fall, but it’s been chosen as a Junior Library Guild Selection, which I'm calling momentum. Another TV Turnoff Week starts September 20th, in time for the book’s actual pub date (Knopf, ages 8-12). It seems like several of the I.N.K. bloggers have been hitting the road lately, and I’m one of them. I’m in Mexico so my friend and colleague David Elliott has agreed to take my place today. David considers himself a children’s fiction writer and I suppose that’s true. He’s too gracious to say it, but the novel he mentions below, Jeremy Cabbage and the Living Museum of Human Oddballs and Quadruped Delights, has been optioned by Fox 2000. But some of David’s picture books are poetry about animals and could easily be classified as nonfiction. On The Farm, for example, received many starred reviews because David used facts and great eloquence to distill common farm animals to their very essence. If you want to know more about him, check out http://www.davidelliottbooks.com/index.html. I grew up in the 50s in a Midwestern farm town, the kind of place where on Saturdays the farmers sat on the courthouse lawn while their wives did the weekly shopping. It was a town very much like thousands of others scattered throughout the no-nonsense states of Ohio, Indiana and Michigan. But it did have three distinctions. 1) It was the home of the Mills Brothers. 2) It was the site of the first concrete street in the United States. And since my friend Susan Goodman has taught me that any quirky fact can become a compelling story in the hands of the right person, I’ll give you the name: Court Street. 3) It had a Carnegie Free Library. This library sat on a rise, directly across from the Eicholtz Funeral Home, and kitty-corner to the Lutheran Church. It was the grandest building in town, a neo-gothic affair with a sturdy column on either side of its welcoming entrance. But I didn’t need encouragement, architectural or otherwise. To a working class kid like myself, anything free was good. I spent a lot of time there. I still remember the way that library smelled when you crossed over its oak threshold, a peculiar mixture of floor-polish, new books, and vomit (a lot of kids used that library) all permeated with the florid scent of the librarian’s eau de toilette. But it’s the library’s floor plan that I’ve been thinking about. As you entered the foyer, wide and high-ceilinged, the kids’ books were tidily shelved in low cases in a room to the right. To the left, directly opposing was the reference room, with its maps, and its histories, and its encyclopedias. Even now, that room gives me a bad feeling. There was only one reason to go in there: Homework. Recently, I have had the good fortune to visit another Carnegie Free Library, here in New Hampshire, and to my surprise the floor plan was exactly the same. The reference room was on the left, the kids’ books on the right. This arrangement set me thinking because it seemed to reinforce the odd idea that the world of the fiction was naturally distinct from the world of facts. (No doubt, there were some nonfiction books in that kids’ room, but not many, and I certainly didn’t know where they were shelved.) I understand the comfort of this kind of polarity. It’s clean, and we all know what cleanliness is next to. But I wonder if this kind of thinking sacrifices what is true for what is easy. I’m now not so sure that this border between fact and fiction exists at all, or at the very least, if it isn’t more liquid than we allow it to be. After all, every scientific advancement, every cultural artifact, every technological gizmo first started in someone’s imagination. And our imaginations would be useless without some hard nouns, some facts to pin them onto. As a fiction writer, I couldn’t get anywhere without the nonfiction world. This is also true when I’m working on a picture book. Recently, in doing some research for a book of verses about wild animals, I learned that it’s the lion’s ability to roar, along with the tiger’s, the leopard’s and the jaguar’s, that makes them Great Cats. I also discovered that lions rarely roar in the daytime. Who knew? But these two pieces of non-fiction became the basis of the verse that will open the book. And the reverse is true as well. In looking at some of the fabulous nonfiction books currently being published, it’s clear that without the engagement of their authors’ imaginations, the books would not be books at all, but simply glorified lists, the kind of thing that as a gift felt the equivalent of getting a toothbrush in your stocking at Christmas. In my most recent novel, the protagonist is a street kid who has taken up residence in an abandoned library. In one scene, we see him in the library’s fiction section, reading to find some comfort from the sad truth of his life. I wonder now why I didn’t let him find the nonfiction shelves. Surely, there is just as much comfort to be found in learning about the lives of children, say, from Pago-Pago, the peculiar habits of the naked mole rat, the downfall of history’s biggest bullies. Or maybe, I should have revolutionized those shelves altogether and put The Truth About Poop next to Octavian Nothing, Rocks in His Head next to From the Mixed Up Files of Mrs. Basil E. Frankweiler, thereby destroying a dichotomy that may not be as clear as we sometimes think. One thing that being middle-aged has brought me (along with creaky knees and, as my hairdresser once commented, “platinum highlights”) is the beginning of a sense of perspective. This has proved true in my own life, and in my writing career. I’ve had some amazing highs—the deep satisfaction of nailing an idea after weeks of floundering; starred reviews that sent me flying out the door to walk the streets of my neighborhood until I calmed down enough to get back to work. I’ve also had my share of dismal lows—the five year period when I did not sell a single manuscript; the review in a major newspaper that called my writing style, and I quote, “irritating.” Ouch. I’ve pursued intriguing book ideas that sometimes work out beautifully (see “high”, above), and sometimes bite the dust after weeks or months of work (and that would be a “low”). But as the list of highs and lows grows longer, it does make it a little easier to step back, take a deep breath, and then soldier on. Perspective. About 20 years ago, some of you may recall, there was a national advertising campaign to Name the Raisins—an animated (literally) rock band that sang “I Heard It Through the Grapevine” on TV commercials. My husband and I were in school, we were broke, and I really wanted to win the $10,000 prize. Besides, how hard could it be to name a piece of dried fruit? I like raisins. Truly, I do. And the fact that you had to submit raisin box tops with your raisin names meant that we ate a lot of raisins that month. I even made a sour cream raisin pie, a mistake I will not repeat. Over the course of that month my long-suffering husband and I managed to eat enough raisins for me to submit three names—three glorious raisin names—to the judges. I tried to think what fun raisins would be like. I didn’t want boring names. I wanted my raisins to have style. To be spunky and just a little bit sassy. MY raisins would have PERSONALITY. Amazin’ Raisin. Jammin’ Raisin (they were in a rock band, after all). And my own personal favorite, Misbehavin’ Raisin. I sent in my names, sat back, and watched the grand prize go… to whoever invented the name Tiny Goodbite. I was outraged. How could Tiny Goodbite compete with that finger-wagging rogue, Misbehavin’ Raisin? Somehow, a Tiny raisin had bested him. So what did I learn from the raisin days? That it’s good writing practice to be playful, to think about character, to have a little fun. That even if your ideas are not embraced by the powers-that-be, there is a benefit to exploring them anyway. And, of course, never to make that pie ever again. Whenever I write and illustrate a book, I try to make it feel like a little movie you can hold in your hands. This means I have 8 different jobs to do, and every one of them comes straight out of Hollywood (just minus the big budget). Hoo-hah! To show how this works, I'll roll the credits. 1. My Screenwriter persona must first conjure up a strong story idea and then write the screenplay. I tend to go for true tales of adventure, and most of my stars stride forth out of history. I command myself to find a brand new twist on these old tales, to be as compelling, substantive, and entertaining as possible, and to be 1,000% accurate at the same time. Remembering that the pictures are King and tell at least half the story, I try to make the script relatively short--but (I hope) as evocative as haiku. entire life. The words go in the narrow white space to the right. 2. Naturally, I hire myself to be the Director. Will I frame my story as a comedy or a mystery, a drama or a thriller--or all of the above? Should the visuals be realistic or might they work best as a Toon? Once I decide, I'll make a storyboard so that each scene is designed to keep viewers on the edge of their seats and eager to find out what happens next. 3. Next I become the Casting Director. To select the best actors and actresses to play my protagonists, my job is to figure out, for example exactly what Charles Darwin or George Washington looked like at a certain age. Or I have to think about John Smith's personality and then deduce the way he might really have behaved in each scene. 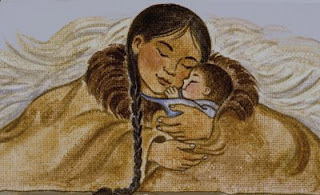 And will my Sacajawea characterization captivate the audience and still be historically accurate? 4. Now my illustrator half morphs into a Costume Designer, a job that calls for more research than you can shake a stick at. Every button on King George III's coat, every fancy collar or piece of jewelry around Queen Elizabeth's neck, every weapon fired by the Cossack army, and every robe and headdress of the Mandan Indians has to be correct down to the last detail. 5. I also get to be the Set Designer, so I have to do the same in-depth research as my costume designer self to make sure that the iguanas on the Galapagos Islands, Lewis and Clark's various boats, and the post offices and libraries in Colonial Philadelphia look exactly right. Got to includes the correct saloons and scenery and equipment from the California Gold rush too. 7. I'm the Cinematographer for sure. For dramatic effect, the lighting has to be just right. So does the mood and the color in each shot. Every scene must move the story forward in a visually interesting way. I can choose to shoot the scenery from above or below. I can use close-ups of faces or add dramatic wide angle shots from afar. 8. I even get to be the Special Effects expert who wows the audience with exploding volcanoes! Gigantic tsunamis! 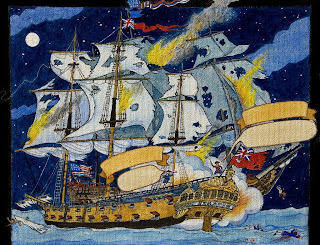 Or fiery ship battles with showers of stars in the mix! Hmmmm....I love all eight of my labor-intensive jobs, and like all the rest of the nonfiction author/illustrators out there, I never have time to get bored. But I'm thinking that we're all about due for a raise! Picture credits in order of appearance come from the following books: How Ben Franklin Stole the Lightning; How We Crossed the West: The Adventures of Lewis and Clark; John Smith Escapes Again! What Darwin Saw; the Journey that Changed the World; John Smith Escapes Again! (again); and George vs. George; the American Revolution as Seen from Both Sides.